We all want to save as much money as we can on our bills, especially those frighteningly high ones like the electricity bill. But when it’s hot as the surface of the sun outside, there’s no denying that air conditioning is vital to survival — but that doesn’t mean you have to rely on the same old technology year after year. Today’s homeowner has options when it comes to cooling a home, the most common being heat pumps and standard air conditioners. Choosing between these two units can be a challenge, but if you understand what each can do for you, you’ll be able to make the right decision this summer. Reversing Valve. This neat little bit of equipment is what really makes a heat pump different from an air conditioner. The reversing valve does exactly what you’d think it does: it reverses. What it reverses is the refrigeration cycle, allowing the same technology that cools your air all summer to heat your home all winter. So, instead of just expelling the heat from inside your home to the great outdoors, a heat pump can also take heat from outside and bring it indoors. It’s a nifty little trick, to be sure. Defrost Thermostat. All that reversing can result in a great deal of ice build-up during wet and cold weather, so heat pump manufacturers have equipped them with defrost thermostats that turn on small heating coils to melt accumulation away. Typically, these defrost cycles happen every 90 minutes to prevent massive ice from forming on the fan blades of your heat pump. Ice build-up has serious consequences and can result in the premature death of your system. When it comes to air-sourced heat pumps (the most common found in residential use), the easiest way to think of them is as souped-up air conditioners. 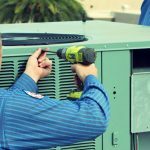 Although there are some differences, air conditioners were the technology that heat pumps were built from — this is why the differences are so subtle. Depending on the climate where you live, you may find that an air conditioner is all you really need — in which case, paying the extra price for a heat pump for the four or five days a year when it may drop below 50 degrees at night seems like a waste. Here in Phoenix, there are plenty of nights that will drop well into a range where heating is needed, so it’s important to weigh the pros and cons of each type. Air conditioners are inexpensive, incredibly efficient and will cool all day long. They’re much simpler pieces of equipment than heat pumps, meaning they have fewer parts to break as they age. They’re also more efficient when it comes to cooling, saving your energy dollars when it’s hot outside. 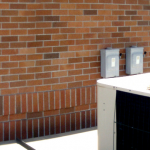 Air conditioners tend to be smaller, so they appear more often as parts of packaged units and take up a tinier footprint when installed in your yard. Heat pumps can be significantly more expensive than air conditioners, but provide heating as a bonus to their cooling abilities. Unfortunately, many units will be unable to function properly at temperatures below freezing, so you’ll need a backup heating plan for unusually cold nights. This is rarely an issue in Phoenix, however. Even though your new heat pump is a little bigger than your old air conditioner, you’ll be adding heating equipment without having to make any additional space in your home. Heat pumps are great pieces of equipment, provided you don’t mind being a little warmer on the hottest days. Since they’re less efficient than air conditioners when it comes to cooling, you won’t be growing icicles from the ceiling during the summer, but you can maintain comfortable indoor temperatures even when outdoor temperatures are above 100 degrees. 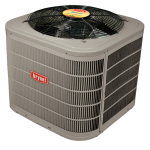 At Precision Air and Heating, we’ve installed plenty of air conditioners and heat pumps, and we can help you choose the unit that’s right for you. Call us today for a consultation. We’re available to answer your questions 24 hours a day, seven days a week at 1-602-349-6922.